An ‘unknown’ artist’s oil-on-canvas painting of a billion-dollar bill with Barack Obama’s face on it has been gratefully received by the US president himself. 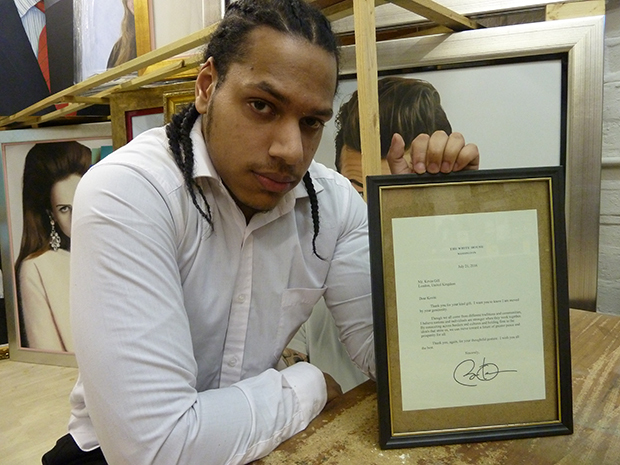 Artist Kevin Gill, 20, from Homerton, wrote to David Cameron earlier this year asking him to present the artwork to Obama when he visited. He was politely told this would not be possible, however, and was referred to the US Embassy in Grosvenor Square. Undeterred, he asked Embassy staff if they would mind passing the gift to the 44th President of the United States, and they agreed to do so. “I wrote to the US Embassy and said: ‘I’ve got a billion dollar bill for Barack Obama and I think it would make a great present as this is his last year in office,’” Gill told the Hackney Citizen. After Obama’s visit to London, a letter from Washington DC promptly arrived at Gill’s home, signed by Obama himself and thanking him for the present. In the letter, Obama said he was “moved” by the generosity and wrote that “holding firm to the ideas that unite us we can move forward toward a future of great peace and prosperity for all”. Gill, who is being mentored by East London street artist Stik, said he was thrilled with the response. 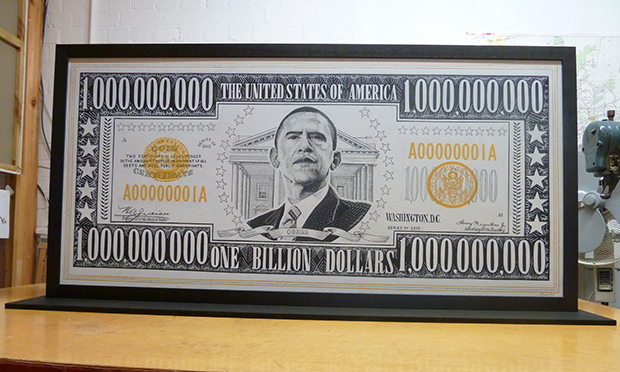 He added that he had chosen to paint a billion dollar bill because it represented a “first” as “there has never been a billion dollar bill” and that, until Obama’s election, there had never been a black President.